When you drive North or South on I-15 between University Ave. and El Cajon Blvd. you can’t help but notice a few unique things, especially if you compare the ride to being on 805 between the same streets. First you notice the walls go straight up and down rather than splayed wide like a sliced piece of chicken. Second, when you go under University or El Cajon you’ll notice the street covers are larger than other underpasses on I-15. The third thing you notice is that you pass under a block long cover; so long it’s necessary to light it up underneath, and long enough to honk your horn at least three times before you hit sunlight again. Then you notice there are trees on the wide covers. If you are really attentive and you are heading north, you can look to your left just before University Ave. and there is a huge park adjacent to the freeway. If you look up right then you will see a footpath connecting the homes on each side of the freeway as well. If you are quick and you look at the University or El Cajon overhead signs you will see that they read “Transit Plaza.” You won’t see that designation on other large green overhead signs on the interstate. At the Adams Ave. bridge look left and you will see another park butting up to the freeway. You will probably notice that the Adams Ave. bridge is smaller than those of El Cajon and University. The walls are straight from end to end on either side of the tube. In the middle of the freeway from end to end through Mid City you see a vacant wide lane sitting there like it is waiting for something to happen, some future plan. Something happened to create all of those differences. They didn’t just show up fully blown from an engineer’s sketch pad. It was the assertive voice of the people of City Heights that modified the design over a period of at least twenty years. The covers, in some people’s eyes, stand as an urban monument to citizen activism, focused on things larger than anything they might ever work on for their whole lives. Each of those design details was pushed for by City Heights residents through many, many meetings and appearances at government hearings. There are people who, over twenty years, took on each of those details and pushed for them to be part of the design. They own them and walk around with the personal satisfaction of having caused a significant change in their environment and in the freeway experience in their neighborhood. It seems like they should be memorialized somehow, with a little plaque, a mural, a string of flashing lights, a monument, some commemorative sculpture, a story board of some kind. The story starts about 1983 when Caltrans decided to extend the I-15, which runs from one border of the country to the other across a piece of geography that had about 5000 people living on it and just happened to intersect between two schools, an elementary (Central) and a middle school (Wilson). Because the geography had been overbuilt with apartments, maybe another 10,000 people lived just adjacent to the freeway path. Caltrans had let the plans lay dormant for many years. The moment they opened the file a letter was sent from the community signed by Jim Bliesner. It said, “if you build this 2.2 mile freeway extension you will negatively impact the lives of thousands of people and you will destroy any ‘community cohesion’ that might exist.” The procedural foot was in the door. From then until today the residents of City Heights have met and met and organized their way through more conceptual and technical information than most graduate level planners or engineers, all followed with the question”What about the people?” They asked for parks at either end using dirt from the excavation. They asked that the walls be built to funnel the bad air up and out of the community. People like Joan Fitzsimmons and the late John Taylor insisted on the desires of the community to build the walls so that in the future they could support additional covers. They asked that the middle of t he freeway be designed to incorporate the trolley or bus rapid transit in the future. It was all written into the agreements with Caltrans and the City about 1989. The City Heights Community Development Corporation (CHCDC) had been organized by residents just for issues like this. They said they wanted the whole freeway covered and turned into an economic and residential model similar to downtown Phoenix and downtown Boston. The CHDC wrote a grant and hired the professionals who designed those covers to show that it could be done. Caltrans and the City said there was no money. A funding strategy was developed. CHDC leaders including Barry Schultz, John Stump and Bill Baber and residents organized a redevelopment district and wrote a plan that covered the freeway. They asked the City Council to come and hear the plan in an old church, now replaced by the library. The City Council sat on a small stage looking at supporters that spilled out the windows and doors like an old fashioned church camp meeting. Everyone was sweating on a hot summer night. CHDC leaders sat with design professionals at a long table and detailed their dream in colored slides. The council voted to accept the report, and subsequently voted to accept the community plan and then the redevelopment plan. Meanwhile construction had begun. The CHDC had two noted organizers–Jay Powell and Frank Gormlie– to bring the community forward. Residents were grieving at all the vacant land left by the destruction of so many homes on the 40th Street corridor. Their friends had been sent away and their homes and memories crunched under the bulldozers or loaded atop trucks and planted on a squatters plot in suburban Tijuana. As much out of sorrow as forward looking joy the community leaders said let there be a garden for all those lost. The newly arrived immigrants from Asia came forward and the flowers, art and vegetables bloomed for two years while Caltrans negotiated designs. In 1991 community leaders traveled to Washington DC to solicit then Congressmen Lowery and Cunningham to insert a “earmark” item into the transportation budget to expand the sidewalks above the freeway on University and El Cajon; to create a platform for future commercial development and a transit stop. Cunningham did. It passed, providing $5 million dollars for the project. Redevelopment funds were around the corner. The community then mobilized behind John Hartley, a city council candidate who promised to do everything possible to cover the whole freeway. Meanwhile, some opposition emerged from the community against the full cover. The residents of Kensington held vigils against the cover for fear that “those” people might then have easy access to their treasures they hid in their homes. The community stuck with the dream of a cover from end to end with new grocery stores, a community college facility, parks, a library, a new post office, and went so far as to invite Sol Price to put a Price Club over the freeway. The tensions reached their peak at a final council vote in 1990 to approve the final agreements with Caltrans. Councilman Hartley sold out and voted with Councilman Roberts to proceed with construction, incorporating all the details requested by the community to mitigate the negative effects of the Caltrans design, but denying the full cover. The rationale was that the land next to the freeway was not worth enough to justify the cost of the covers. Funds from the redevelopment district began to accumulate. As they say “one man’s ceiling is another man’s floor.” Price Charities and former Councilman William Jones accessed not only philanthropic funds from Price Charities but City general fund dollars, redevelopment funds, municipal bonds, and eminent domain to scrape six or seven more blocks of housing and build everything that had initially been designed on the freeway cover. But they were instead located four blocks to the east. They closed a grocery store and opened a police station. The community held a funeral for the lost grocery store. Between the scraping of the land for the freeway and the land for the Urban Village, some estimate that more than 4000 residents were displaced. The community of City Heights was bursting forth in erratic spurts and starts, in some cases betraying the original desire to build community cohesion and not destroy it. A loyal following of residents trailed the Price work as a newly formed Town Council. What was built has been sold now to a national investment firm, but the community still “owns” the freeway. The memory of the original design did not fade from the CHDC’s playbook. For the next fifteen years the CHCDC board with Steve Russell, Jay Powell and staff advocated for SANDAG to fund the construction of transit stations on University and El Cajon. These transit stations would provide access a high speed transit system below that would take residents to outlying jobs. They called it Mid City Moves. Funds were recently allocated to move that project forward ($42 million). The community participants have changed over time but the intrusion, or the dream, however you see it remains. The large decks need commercial structures to reunite the business district. The access to the transit stations needs redesign. City land lays vacant waiting for innovative development. And most of all, the walls of the freeway await additional cover. For more history about the the I-15 construction and citizen activism in City Heights: A Freeway Runs through It. Jim- thanks for laying out this important piece of history that involved so many people and for such a long period of time. Activists are often cautioned that they need to be into an effort for the long haul. The”long haul” on the I-15 advocacy means that the high school kids who worked on the garden art around the community garden are now in their mid thirties. Few communities would have continued to persevere and continue to generate leaders who could keep that dream alive. But this is City Heights. And we are that kind of community. Jim Thank you for your article. Maybe we should put it in a time capsule so that the story will motivate the residents of the future. Jim thank you for the recap of those days. I remember them well, along with YOUR vision to be creative with design and widths of the over passes. You are very kind in how you have figured out the way to compliment the end results. 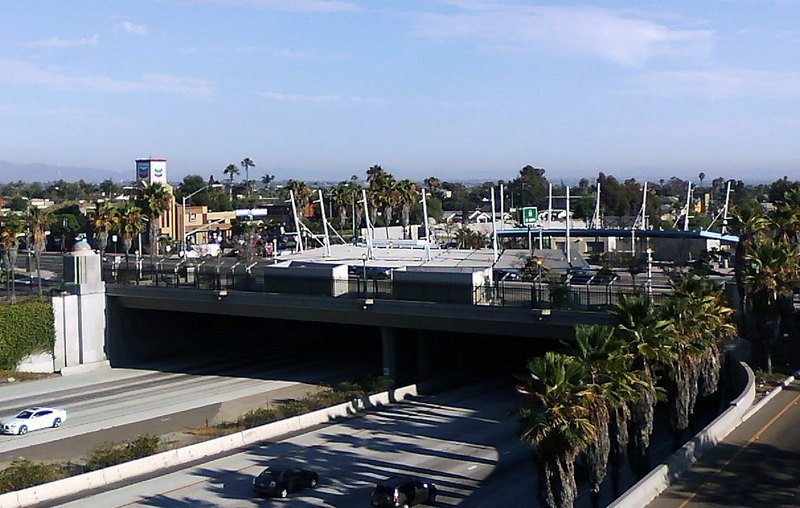 There were many, many meetings with the city, state and federal officials, planning people who were not at all interested in creating something different than all the other overpasses in California. You deserve so much credit for what is there today. Take some credit, my friend. You too Susan. Your boss Lucy was helpful as well. The Teralta Park and SR-15 story is an incredible one. Great article. All freeway corridors in urban areas should have the bike/ped, transit, community identity, and open space features of the SR-15. It’s still hard for residents of today to visualize what you visualized for a freeway corridor 30 years ago. I’ve read the MOUs from the early ’90s in detail and the language sounds like something written today. The residents of City Heights who spearheaded it were decades ahead of their time. Thank you, Jim, for your leadership. It’s an honor to work w/ you and all the other greater leaders of City Heights still fighting to complete the vision. Great having you there Randy and Sakara with the Teralta Park and the bike advocacy and especially the follow on you have been doing with the high speed buses. Thanks, Jim. It’s my pleasure. To clarify my comment above, an extremely large amount of residents are the boldest and most ambitious visionaries I’ve ever met. When asked to visualize a freeway corridor, some generally do not think of bike/ped bridges, parks on the top of freeways, transit plazas, etc. And the theme is that the work is not done. Great point, Jeff. We’re still pushing hard on the I-15 Bike Path. The path was recently designed and environmentally cleared. We have a funding source in mind but Caltrans and the City are debating about who should maintain it. Neither of them wants to. Since the path is on Caltrans Right of Way, I’m of the opinion that Caltrans should maintain it. That committment would be consistent w/ their intention to become more multi-modal, per the CA Complete Streets Act which specifically mentions the importance of maintenance. We also have a planned approved to make Central Ave a Bike Boulevard from Park De La Cruz in City Heights to Adams Ave to feed into the fully separated Bike Path that will run from Adams Ave down to Mission Valley. Great story, thanks for sharing. The house where my dad lived in high school, as well as my mom’s old apartment, as well as their favorite high school date spot (Nicolosi Restaurant, which lived on in a different location for both of them to tell me stories of their courtship every time we visited), were all I-15 victims. What I’m left wondering – are you saying all of the infrastructure is already in place to eventually put a large-scale cover on the freeway to re-unite the neighborhood? Dave, that is my understanding. I can see that some design elements would need to be changed but at some locations along the route the opportunity to add cover is there. Also kudos to Randy van Vleck and the CDC under Jay Powell and Steve Russell for keeping the center lane issue alive so many years after the freeway construction. Thanks, Jim. You set it on the right trajectory. We’re just trying to keep that trajectory going.